Correction: Make that the giant virgin with green hair. 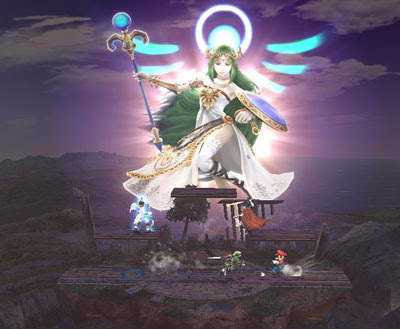 Days after I note the relative obscurity of the character Palutena from Nintendo's 8-bit classic Kid Icarus, she reappears in large-scale high-tech glory. Figures. The Smash Bros. Brawl developers blog that I mentioned earlier posted some screenshots of the pseudo-Greek deity last night. She's, um, a lot taller than I remember. The little video game mascots scurrying about below her can see up her toga, surely. She's actually very similar in that rendition to Setsuna, Sailor Saturn, from Sailor Moon. Setsuna is Sailor Pluto. Saturn is the little girl with the page boy hair.